As some of you know, I have a second blog, VegCookbook Club, where each month we try recipes from the same vegetarian, or vegan cookbook, and share our experiences. 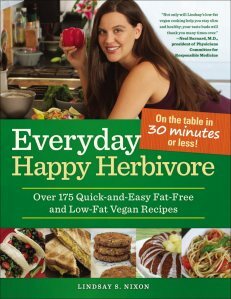 This month's VegCookbook is Everyday Happy Herbivore by Lindsay Nixon. You can learn more about Lindsay on her website happyherbivore.com, her blog, her Twitter feed (@happyherbivore), and her Facebook Page. You can also check out some of her recipes at happyherbivore.com/recipes. Full disclosure: The link to Everyday Happy Herbivore is attached to my Amazon Associates account. If you make a purchase after you click on a link, I receive a small percentage of the sale. Call for Submissions: What Are Fun Ways Nonprofits Can Use Pinterest? Did you know that Pinterest is the third most popular social network? You’re invited to submit your blog posts for consideration any time before Monday, June 25th. On Wednesday, June 27th I'll post a round-up of some of the best posts on Have Fun, Do Good. To see an example of a blog carnival, check out the May Nonprofit Blog Carnival roundup hosted by Lori Halley at Wild Apricot on the topic of Nonprofits Going Mobile. What Kind of Blog Posts Would Be a Good Fit? Entering a blog carnival is a great way to bring traffic to your own blog. If your post is selected for inclusion in the carnival round-up, I'll link back to it (which search engines love), and your writing will be introduced to new readers. Include your name, your blog’s name and the URL for the post in the text of your email. Folks from every aspect of our society, and every profession are involved in the food system. As I vision ahead, I see this being a situation where hundreds of thousands of young people want to do this, but we have to quantify a lot of things to make this a reality for folks. Will Allen is an urban farmer who is transforming the cultivation, production, and delivery of healthy foods to underserved, urban populations. 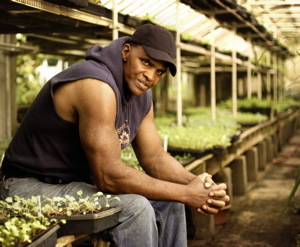 After a brief career in professional basketball, and a number of years in corporate marketing at Procter and Gamble, Will returned to his roots as a farmer, using his retirement package to purchase a plot of inner city land with greenhouses, where he has built the country's pre-eminent urban farm. He is now the CEO of Growing Power, an organization that develops community food systems. In 2008, Will was named a John D. and Katherine T. MacArthur Foundation Fellow, a "genius grant," only the second farmer ever to be so honored. He is also a member of the Clinton Global Initiative, and in February 2010, he was invited to the White House to join First Lady Michelle Obama in launching, "Let's Move!" - her signature leadership program to reverse the epidemic of childhood obesity in America. In May 2010, TIME magazine named Will to the TIME 100 World's Most Influential People. In 2011, Allen was named one of the 7 World's Most Influential Foodies by Michael Pollan and Forbes Magazine. He was named the 2012 NCAA Theodore Roosevelt Award recipient. He lives with his wife in Oak Creek, Wisconsin, and is the author, with Charles Wilson, of The Good Food Revolution: Growing Healthy Food, People, and Communities. I mentioned in the intro that I was first introduced to Will's work in FRESH the Movie, which came out in 2009. I also saw a more recent profile of him this spring on Food Forward. Full disclosure: The link to The Good Food Revolution is linked to my Amazon Associates account. If you purchase something after clicking on the link, I receive a small percentage of the sale, which I'll probably spend on more books! Also, I received a review copy of Good Food Revolution. I have a confession to make. I'm not a totally green cleaner. If you look under my kitchen sink, you'll see that I have Ecover Automatic Dishwasher Tablets next to Comet, Seventh Generation Toilet Bowl Cleaner next to Windex, Planet Dish Soap next to Soft Scrub. • I did some work this month with Upwell, a nonprofit social media PR agency that is working to amplify ocean stories online. • I saw a documentary called Watershed about the threats to the Colorado River (find a screening near you). Water is so darn important. I can't justify putting chemicals down the drain anymore. What do you use to clean your home in an environmentally friendly way? I'm a guest curator over at Jenny Doh's CRESCENDoh this week! 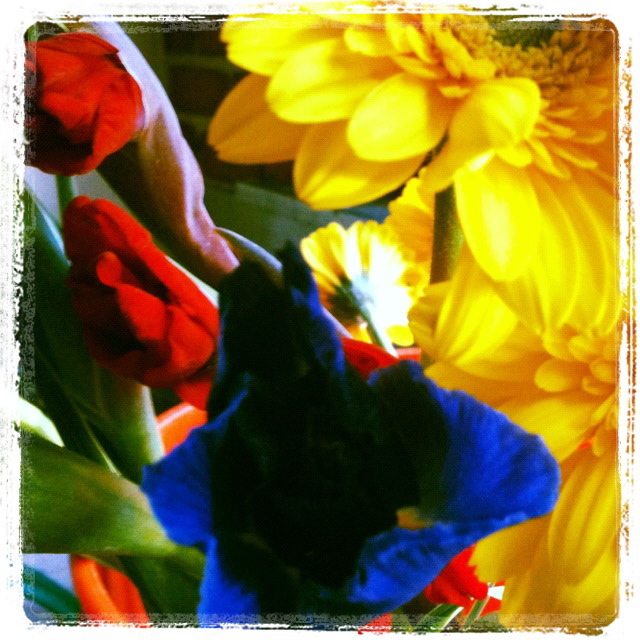 Each day I'll share links to two blog posts about creative projects that inspire me. Jenny also asks guest curators to share a story about how art has been a positive force in their life. You can read mine by clicking here. You can learn more about Jenny, CRESCENDoh, and her book, Art Saves: Stories, Inspiration and Prompts Sharing the Power of Art, in my interview with her on the Arts and Healing Podcast. Full disclosure: The link to Art Saves is connected to my Amazon Associates account. If you buy something after you click on it, I will receive a small percentage of the sale, which I'll probably use to buy more books! 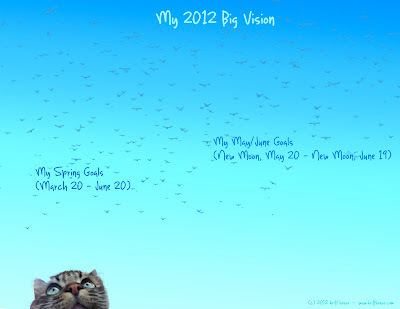 Here's your Big Vision worksheet (created by the hubs!) for the next lunar cycle (May 20-June 19). You can download a PDF of it from Dropbox by clicking on this link: http://bit.ly/KuIBWb. Tip: I email mine to the local copy shop, and ask them to print it on their super duper color printer. I write out my goals for the year, season, and lunar month with a Sharpie, and tack it to my home office bulletin board, so I can look at it often. If you're having trouble filling it out, and need a "thinking partner," lemme know. The fourth blogger in this run of the Have Fun, Do Good guest post series is the delicious Meg Worden (I say delicious because I love her e-cookbook, Salad Alchemy). 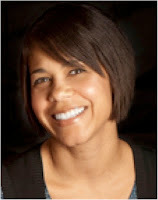 Meg is a writer, speaker, storyteller and a certified Holistic Health Coach. She is the founder of Feed Me Darling, a business that helps professional women eradicate food cravings and gain lasting control over emotional eating. Meg works with clients to heal and balance their bodies so that they can do their best work in the world. She writes for Elephant Journal, The Nervous Breakdown, Jack Move Magazine and has been published in a variety of other places both online and in print. She is also a registered yoga teacher and plans to have a finished memoir project by the end of this year. You can connect with her at feedmedarling.com and on Twitter @megworden. During a nutrition summit last year in New York, I was listening to Deepak Chopra speak (which was awesome), and he was talking about different kinds of happiness. Some choices give you pleasure in the short term and some choices give you long term fulfillment. And the fastest way to long term fulfillment is to seek the happiness of others, he said. The idea that pleasure is more deeply inherent in service than selfishness thrills me. Doing good is fun. And it’s a sweet life to have been able to turn service into a supportive business model. My work as a Health Coach is deeply rewarding. And incredibly fun. I get to talk to brilliant women all day long. There is always a lot of laughing. And witnessing of miracles. Also, I am a writer, storyteller, and part time editor of other people’s novels. Story is incredibly important to me. It is both integrated into my coaching practice, and spilling over the edges in its own lovely world. Learning how to tell a personal story is a powerful tool for healing. Or more accurately, learning that we can tell our own story. That we don’t have to be chained to the singular story of suffering looping around in our mind. We can rewrite it as a beautiful adventure anytime we like. And then when we take it to the world, sharing a story is a direct pathway to human connection, open heart to open heart. I wanted to let you know about 4 blogging workshops coming up, in case you're interested. A fun group blog coaching experience! Check in with the Circle on a weekly conference call, and/or on the private class blog. Share your blogging goals for the week. Ask for suggestions for how to move through challenges. Support other Circle members with their successes and challenges. 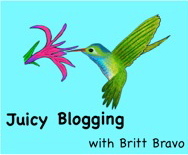 Receive ideas, tips, resources, and cheerleading from the Juicy Blogging Circle’s facilitator (me!). 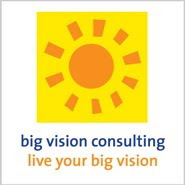 I'll be teaching with the fabulous Kivi Leroux Miller, author of The Nonprofit Marketing Guide. The e-clinic includes five hours of training and personal coaching via webinars where you'll learn how to create a relevant blog that keeps supporters tuned in to your nonprofit. Every session will be recorded in case you can't make a session live, or want to go back over certain sections. Full disclosure: The link to The Nonprofit Marketing Guide is linked to my Amazon Associates Account. If you make a purchase after clicking on the link, I get a small percentage of the sale, which I will most likely use to buy more books! The third blogger in this run of the Have Fun, Do Good guest post series is the wonderfully wise, Christine Egger. Christine is a facilitator, network weaver, and catalyst. She works with individuals and organizations whose mission is to increase our capacity for empathy, generosity, and creativity. You can learn more about Christine at cdegger.com, or find her on Twitter at @cdegger. How do I have fun and do good? In my experience the most fun, most good-doing conversations are the kind in which the participants not only learn about themselves and each other, but actually become themselves in the process. I come away from them feeling changed, like some part of me shifted into something that’s, well, more me. And the others involved do too, whether they’re individuals or organizations or projects or whatever. Sometimes – not always – the connection is prescribed and there’s a goal involved. Something we’re “conversing for the purpose of.” It might be as simple as catching up with a friend. It might be as complicated as bringing many companies (or countries!) together to see whether there might be untapped opportunities for them to partner in new ways. Room. To meander. To be surprised. To follow impulses and question-threads and then circle back and follow another. And acceptance. Of who and what we are when we show up. Of what we discover about ourselves and each other. Of the new who and what we become as we explore. Those are the kinds of conversations I love. Where the participants are living among. Being with. Feeling simultaneously accepted and invited-to-change. Given room. And generating words that ring true, and ideas that resonate. My second guest blogger in this run of the Have Fun, Do Good guest post series is the warm and wonderful Jocelyn Harmon. Jocelyn is passionate about helping nonprofits to succeed online so that they can change the world! As Vice President of Sales and Marketing for Network for Good, she is privileged to lead the team to help over 5,000 nonprofits raise more friends and funds online. Prior to joining Network for Good, Jocelyn was Director of Business Development for Care2, where she worked with some of the most respected national nonprofits, including ASPCA, Environmental Defense Fund, The Carter Center, Legacy and IFAW (International Fund for Animal Welfare) to help them acquire new donors, members and advocacy supporters online. Jocelyn is also a recognized blogger and speaker on online marketing and fundraising. You can read her writing in Fundraising Success magazine and her personal blog, Marketing for Nonprofits. 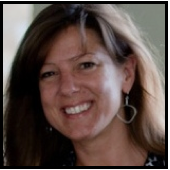 Finally, she serves on the board of directors for NTEN (Nonprofit Technology Network). Jocelyn has a bachelor's degree in literature from New York University and a master’s degree in sociology from University of Washington. You can follow Jocelyn on Twitter at @jocelynharmon. Developing deep, engaging, inspired and inspiring relationships with my nearest and dearest is one of the great joys of my life. I also LOVE being a connector, coach and mentor to others and helping them to succeed. Words are another passion of mine. For me there is nothing like the thrill of curling up in bed with a book or polishing off a (hopefully good) blog post. It sounds “old-school” but I love to go to my local library every Saturday to wander up and down the stacks. If I'm honest, my hope is that weekly practice will spontaneously ignite the manifestation of my own memoir! Another big treat is for me is Amazon Overnight Delivery. Seeing that box on the deck after a long day of work is like magic! Expressing my love for technology is not totally accurate. While I’m often glued to my iPhone or Mac (ask my husband and daughter), more than the devices themselves, I love the PROMISE that technology offers. Access to new and diverse individuals. The opportunity to create and be creative with little cost. Instant connection to unlimited knowledge and ideas! All of these benefits energize me and (for all of it’s challenges) I feel privileged to live with technology and in the Connected Age. Finally, telling the truth or living an authentic life, keeps me having fun and doing good. Being honest with myself and others is critical to my happiness. And, I’m on a quest to live a more authentic life every day by staying in touch with my deepest truths, accepting (even loving) my imperfections and asking for help. On Sunday, my friend Heather of Create Your Own Beautiful, and I participated in Plant a Kiss Day. Plant a Kiss Day was organized by pal Sherry Richert Belul to celebrate the message behind Amy Krouse Rosenthal's book, Plant a Kiss, a story about how one small act of kindness can bloom. 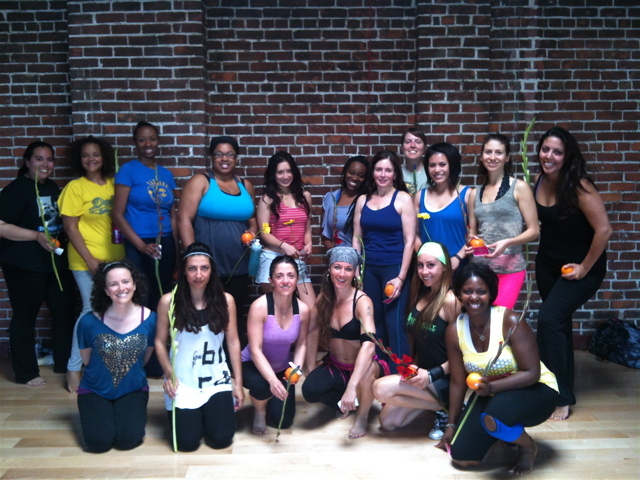 Heather teaches an awesome dance fitness class, ShimmyPop!, at Hipline on Sundays, so after class we "planted a kiss" by giving all of her students flowers and oranges. Fun! Today through May 4th, 16 bloggers (including me) are posting about what we did on Plant a Kiss Day, and taking part in a Blog Hop Party. If you go to the main Plant a Kiss page, you'll see links to the other bloggers' posts. For every blog you visit and comment on, your name will be tossed into a hat for a chance to win one of an array of fun prizes (I'm giving away a one-hour juicy blog coaching session). Even though Plant a Kiss Day was on Sunday, you can plant one yourself any day (like today!). Full disclosure: The link to the Plant a Kiss book is attached to my Amazon Associates account. If you buy something after clicking on the link, I will receive a small percentage of the sale.